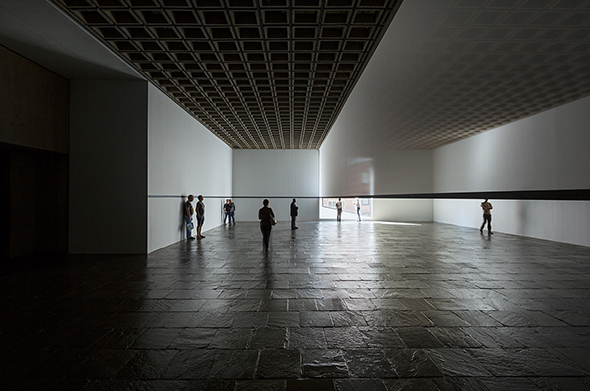 Robert Irwin, Scrim veil—Black rectangle—Natural light, 1977. Installation view, Whitney Museum of American Art, New York. Cloth, metal, and wood. 144 × 1368 × 49 inches. © 2015 Robert Irwin / Artists Rights Society (ARS), New York. Photo © Philipp Scholz Rittermann. Artifex Press is pleased to announce that it will publish the Robert Irwin catalogue raisonné, and that Marianne Stockebrand has been named Editor of the project. Stockebrand, former Director of the Chinati Foundation, Marfa, Texas, and organizer of an Irwin retrospective during her time as Director of Kölnischer Kunstverein, Cologne, Germany, will edit the catalogue raisonné of Robert Irwin’s complete works, spanning six decades, beginning in the 1950s and continuing today. Irwin began his career as a painter, but gave up painting at the end of the 1960s, when he closed his studio and decided to work in given architectural, or natural, environments and develop work in response to them. Beginning in 1970, Irwin worked in, and with, entire rooms or spatial settings, both interior and exterior, intervening in these spaces in order to enhance or alter certain features. Irwin exemplified his approach in numerous museum and gallery exhibitions, many of which were temporary and have therefore been dismantled. He also received commissions for urban projects of considerable scope, including the Arts Enrichment Master Plan for Miami International Airport, the outdoor sculpture Portal Park Slice in the John W. Carpenter Park, Dallas, and the Central Gardens for the Getty Center in Los Angeles. In addition to the paintings from the ’60s and the site-specific projects dating back to 1970, Irwin has since 2008 created a series of pieces made with fluorescent lamps. Works by Robert Irwin are in the collections of, among others, The Museum of Modern Art, New York; The Whitney Museum of American Art, New York; Dia Art Foundation, New York; The Art Institute of Chicago; Centre Georges Pompidou, Paris; Los Angeles County Museum of Art; The J. Paul Getty Museum, Los Angeles; The Museum of Contemporary Art San Diego; and The Indianapolis Museum of Art. He also has the distinction of being the first artist to receive the John D. and Catherine T. MacArthur “Genius” Award, which he won in 1984. The Robert Irwin catalogue raisonné will feature a comprehensive inventory of paintings, sculptures, and installations by the artist with complete artwork information, provenance, installation details, exhibition and publication histories, plus high-resolution images and additional multimedia. The publication will be a sortable, searchable, web-based catalogue published by Artifex Press using its patented software platform. Current and past owners of Robert Irwin works are encouraged to contact Stockebrand at irwincr [​at​] artifexpress.com. Marianne Stockebrand received her PhD in Art History from Ludwig-Maximilians-University, Munich, in 1979. She organized a retrospective of Robert Irwin’s work at the Kölnischer Kunstverein, Cologne, Germany, where she served as Director from 1989 to 1994. Earlier positions include serving as Director of Westfälischer Kunstverein, Münster, Germany, from 1985 to 1989; and as Curator of Krefelder Kunstmuseen, Krefeld, Germany, from 1979 to 1985. From 1994 to 2010, she was Director of the Chinati Foundation, during which time the foundation’s collection expanded to include an installation of poems by Carl Andre (1995); an installation in fluorescent light for six buildings by Dan Flavin (2000); and the John Wesley Gallery (2004). Stockebrand continues her scholarly work and lectures at museums internationally. Artifex Press is a publishing and technology company for artists and audiences interested in art. We have developed a proprietary, patented software platform and a dedicated publishing program in order to create digital catalogues raisonnés of leading artists. Our first digital catalogues raisonnés have been published for Chuck Close, Jim Dine, and Tim Hawkinson. We are currently working on several more, including catalogues raisonnés for Sol LeWitt and Agnes Martin. Artifex Press is dedicated to preserving the legacy of important artists. Our approach combines the rigors of art historical scholarship and the flexibility afforded by technological innovation. Our ultimate goal is to leverage our expertise in software development and catalogue raisonné publishing to preserve the legacy and intellectual property of participating artists and estates.